“One morning,” writes Ron Clarke, “I wasted nearly an hour watching a tiny ant carry a huge feather across my back terrace. Several times it was confronted by obstacles in its path and after a momentary pause it would make the necessary detour. “At one point the ant had to negotiate a crack in the concrete about 10mm wide. After brief contemplation the ant laid the feather over the crack, walked across it and picked up the feather on the other side then continued on its way. Can you imagine God telling us to learn from an ant? So what can we learn? 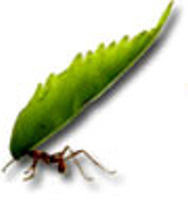 Ants are determined, they are not afraid to work to achieve their goals, they work as a team, they think through and work to overcome the challenges thrown in their pathway, and they never give up. But most of all they teach us about the marvels of God’s creation. Thanks be to God for the miracles of His creation. May He help us to learn the lessons we need to learn from the ants!